Ed Ruszel’s workday is a soundtrack of whirling, banging, screeching — the percussion of wood being cut, sanded and finished. He’s the facility manager for the family business, Ruszel Woodworks. 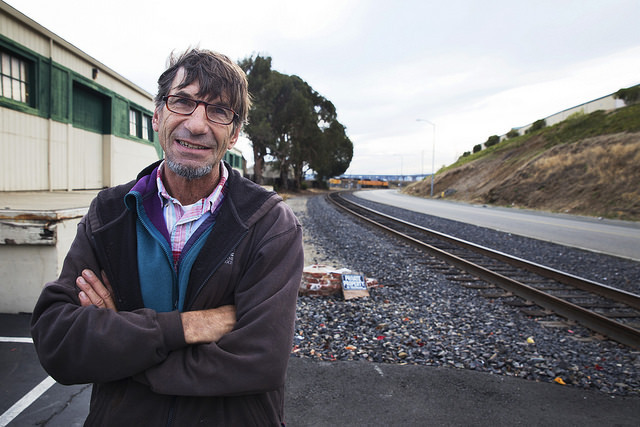 But one sound each day roars above the cacophony of the woodshop: the blast of the train horn as cars cough down the Union Pacific rail line that runs just a few feet from the front of his shop in an industrial park in Benicia, California. Most days the train cargo is beer, cars, steel, propane or petroleum coke. But soon, two trains of 50 cars each may pass by every day carrying crude oil to a refinery owned by neighboring Valero Energy, which is hoping to build a new rail terminal at the refinery that would bring 70,000 barrels a day by train — or nearly 3 million gallons. Valero’s proposed project in Benicia is just one of many in the area underway or under consideration. All the projects are now facing public pushback–and not just from individuals in communities, but from a united front spanning hundreds of miles. Benicia sits on the Carquinez Strait in the northeastern reaches of the San Francisco Bay Area. Here, about 20 miles south of Napa’s wine country and 40 miles north of San Francisco, the oil industry may have found a considerable foe. Unit trains are becoming a favored way to help move this cargo. These are trains in which the entire cargo — every single car — is one product. And in this case that product happens to be highly flammable. 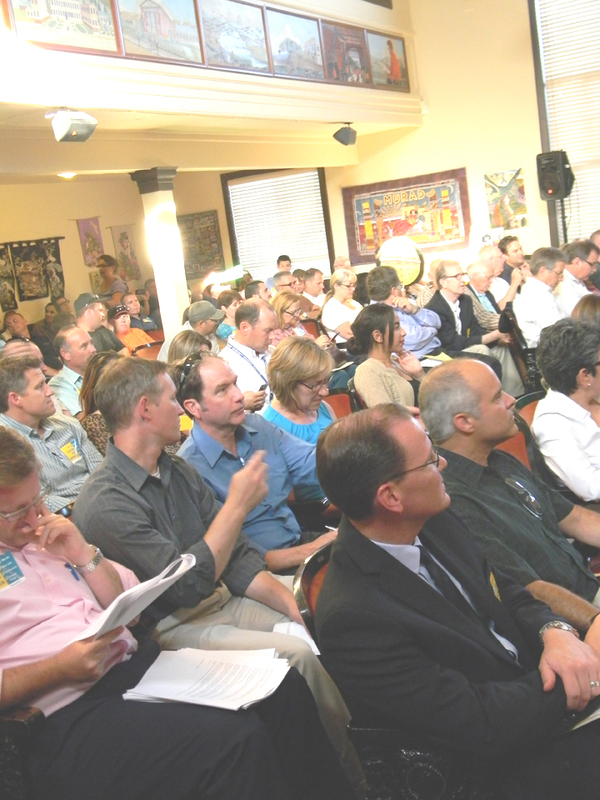 In Benicia, a Draft Environmental Impact Report (DEIR) regarding the Valero project was released in June 2014 and promptly slammed by everyone from the state’s Attorney General Kamala Harris to the local group Benicians for a Safe and Healthy Community because it left out crucial information and failed to address the full scope of the project. Ed Ruszel’s workday is a soundtrack of whirling, banging, screeching — the percussion of wood being cut, sanded, and finished. He’s the facility manager for the family business, Ruszel Woodworks. 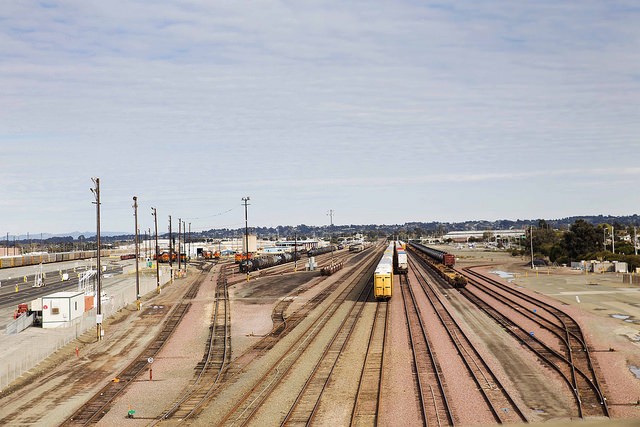 But one sound each day roars above the cacophony of the woodshop: the blast of the train horn as cars cough down the Union Pacific rail line that runs just a few feet from the front of his shop in an industrial park in Benicia, California. Crude by rail has increased 4,000 percent across the country since 2008 and California is feeling the effects. By 2016 the amount of crude by rail entering the state is expected to increase by a factor of 25. That’s assuming industry gets its way in creating more crude by rail stations at refineries and oil terminals. And that’s no longer looking like a sure thing. Valero’s proposed project in Benicia is just one of many in the area underway or under consideration. All the projects are now facing public pushback — and not just from individuals in communities, but from a united front spanning hundreds of miles. Benicia sits on the Carquinez Strait, a ribbon of water connecting the San Pablo and Suisun Bays in the northeastern reaches of the San Francisco Bay Area. Here, about 20 miles south of Napa’s wine country and 40 miles north of San Francisco, the oil industry may have found a considerable foe. The heart of California’s oil industry is the Central Valley — 22,500 square miles that also doubles as the state’s most productive farmland. Oil that’s produced here is delivered to California refineries via pipeline. For decades California and Alaska crude were the main suppliers for the state’s refineries. Crude came by pipeline or by boat. Over the last 20 years imports from places like Saudi Arabia, Ecuador, and Iraq have outpaced domestic production. But a recent boom in “unconventional fuels” has triggered an increase in North American sources in the last few years. This has meant more fracked crude from North Dakota’s Bakken shale and diluted bitumen from Alberta’s tar sands. This is one of the things that has Ed Ruszel concerned. He doesn’t think the tank cars are safe enough to transport crude oil (or ethanol, which is also passing through his neighborhood) in the advent of a serious derailment. But he’s also concerned not just with the kind of cargo, but the sheer volume of it. If a derailment occurs on a train and every single car (up to 100 cars long) is carrying volatile crude, the dangers increase exponentially. The more trains on the tracks, the more likely something could go wrong. In 2013, more crude was spilled in train derailments than in the prior three decades combined, and there were four fiery explosions in North America in a year’s span. This risk Marilaine Savard knows well. I met her in February of 2014 when she visited the Bay Area to tell residents about what happened in her town of Lac Megantic, Quebec. The closest word to describe the experience was “apocalypse,” she said, through tears. Most people by now know of the train derailment that killed 47 people and incinerated half of Lac Megantic’s downtown in the wee hours of the morning on July 7, 2013. The fire was so hot the city burned for 36 hours. Even the lake burned. We now have term for this: bomb train. Just two days before the disaster in Lac Megantic, Ed joined a community meeting in Benicia about the Valero project. For many residents, it was the first they were learning of it, but Ed had known months before. In January 2013 a train carrying petroleum coke leaving Valero’s refinery derailed. It was minor — no cargo spilled — but it did rip up a piece of track, and the stalled train blocked the driveway to Ruszel Woodworks for hours. It was one of three minor derailments in the industrial park in the span of 10 months. Ed came outside to see what the problem was. “The Valero people told me ‘get used to it, because we’re really going to be bringing in a lot of cars soon,’” Ed says. “At that point I really started paying attention and I got really scared.” Ed soon learned about plans for Valero’s new terminal, the 100 train cars that would pass by his business each day, and that it appeared the city was ready to rubber stamp the project — no Environmental Impact Report required. The fire was so hot the city burned for 36 hours. Even the lake burned. To explain one of the reasons for his concern, Ed shows me around his property where the lands comes to a V and two rails lines intersect. The main line of Union Pacific’s track passes along the back of Ed’s property, about 75 feet from his building. Here trains can get off the main line and switch to the local line that runs inside the industrial park. The local track passes by the front of Ed’s property, about 20 feet from the building. The tracks into the industrial park were not designed for a crude by rail facility, Ed says. There are no loops. For Valero to get crude tanks into the refinery, the train must pass by the back of Ed’s property on the main line, pull all the way forward (usually about a mile), and then back up onto the local line, past the front of Ed’s property and into the refinery. The process is reversed when the train leaves. The 100 train cars a day that Valero hopes to bring in will come by his business up to four times per day. That’s a concern not just because of potential dangers from derailments and diesel fumes from idling trains, but also because the industrial park has a rail traffic problem. “My big concern here is specifically with the rails — I realize there are other huge environmental issues and global issues with the kinds of fossil fuel production we’re dealing with now and where it’s going,” Ed says. Already trains servicing the Valero refinery and other industry neighbors can cause traffic nightmares. The trains block driveways to businesses and sometimes major roadways. An off ramp from Interstate 680 empties into the industrial park. Ed has photos of cars trying to exit the highway but are backed up on the interstate because of train traffic. The reason has to do with the area’s history. The tracks that come through the industrial park were not built for industry, but for the U.S. Army. From 1851 to 1964, part of the land now claimed as an industrial park was home to the Benicia Arsenal. Bunker doors in the hillsides and buildings from the 1800s are part of the area’s colorful history. The rail lines moved around troops and armaments from the Civil War through the Korean War, Ed says, but it’s ill-suited to servicing a busy commercial rail terminal. Ed’s family moved their woodworking business to the industrial park in 1980. His brother Jack and their father started the company when Jack was still in high school, and it’s grown to over 20 employees. They’ve always played nice with the other businesses, including the refinery, which was built in 1968 and bought by Valero in 2000. But the Ruszels felt the crude by rail issue demanded they take a stand. While not aligned with any local activist groups, Ed and other members of his family have spoken publicly about their concerns. Their voices are part of a growing chorus in the area. On May 31, 2013 the City of Benicia issued a Mitigated Negative Declaration, which means an initial study by the city concluded there were no significant environmental problems with the project that couldn’t be mitigated. But many residents felt differently and commented on the initial study or voiced concerns at a July 9 city planning department meeting, which occurred just two days after the disaster in Lac Megantic drove home the reality of a catastrophic accident. By August the city sided with concerned residents and decided that a draft Environmental Impact Report (DEIR) needed to be prepared to further review the project. An outside consultant was hired for the job but paid for by Valero. After much delay, the DEIR was released in June 2014 and promptly slammed by everyone from the state’s Attorney General Kamala Harris to the local group Benicians for a Safe and Healthy Community because it left out crucial information and failed to address the full scope of the project. One of the biggest omissions in Valero’s DEIR was Union Pacific not being named as an official partner in the project. With the trains arriving via its rail lines, all logistics will come down to the railroad. Not only that, but the federal power granted to railroad companies preempts local and regional authority. This preemption is one of the biggest hurdles for communities that don’t want to see crude by rail come through their neighborhoods or want better safeguards. An October 2014 editorial in the San Francisco Chronicle lamented, “What’s really crazy is the federal law that allows preemption of municipal and state law when it comes to critical decisions on rail safety. Affected communities deserve a say over what rolls through their towns.” With preemption, that may be impossible. Different kinds of crude have different health and safety risks. A pipeline rupture carrying Canadian diluted bitumen in a tributary of the Kalamazoo River in Michigan in 2010 showed that the thick, corrosive crude is much harder (perhaps impossible) to clean up adequately and is different than conventional crude, which sheens on the surface of water. And Bakken crude has proved more explosive than other crudes because of its chemical composition. It’s likely that some of the crude coming to Valero’s refinery would be from either or both sources. Consider the numbers: In 2013 the total crude by rail brought into California was nearly 6.3 million barrels, and in the first nine months of 2014, the numbers were 4.3 million barrels. The top two sources have been North Dakota and Canada. Further, the DEIR only examines the risks of a minor derailment along a 69-miles stretch of track between Benicia and Roseville. It doesn’t address the hazards (which could be catastrophic) of the three potential routes that the Union Pacific trains may take entering California, which involve passing over mountains, through tinderbox-dry forests, and along critical water sources. Just a week ago a train derailed along one such route in the Feather River Canyon. Eleven cars plunged off the track and down the canyon. Had the cargo been crude instead of corn, its contamination could have made its way down the Feather River to Lake Oroville, a reservoir for millions of Californians. Public comments on the DEIR closed on September 15, and now it’s a waiting game to see what happens next in Benicia. The planning commission will vote on whether to accept or deny the permit for the project. If the commission denies the permit, Valero can appeal to the city council. Either way, it’s likely to end up in court. Ed spends his weekdays on land in Benicia and his weekends on the water, sailing out of nearby Richmond. He has shaggy brown hair, a neatly trimmed salt and pepper goatee, and looks every bit the weathered sailor that he is. Having worked professionally as a boat captain and even as a solo sailor to Hawaii, Ed is a bit overqualified for the nearly windless fall Sunday we set sail with local activist Marilyn Bardet, a member of Benicians for a Safe and Healthy Community. Marilyn has been a refinery watchdog in Benicia for years and worries about more than just the transportation of fossil fuels. “For me it’s not only about whether they were going to bring it by rail, but whether they were going to bring it at all,” she says. Sailing from Richmond, we get a good perspective of how pervasive the oil industry is in this area. We pass a couple of blue and white docked ships with their decals reading “Marine Spill Response.” Ever since the Exxon Valdez spill in Alaska, Ed explains, the industry pays into a fund that keeps ships at the ready in case of an accident. Ed points the bow of the boat toward the Long Wharf in Point Richmond where hulking oil tankers sidle up to be unburdened of their cargo. We also have a clear view of the large terra cotta-colored storage tanks nesting above neighborhoods in the hillsides of Richmond. These are part of the sprawling refinery operations run by Chevron, but first begun by Standard Oil in 1901. And it’s not the only refinery around here. In the North Bay, there are five along a 20-mile crescent, with Richmond and Benicia being the bookends. In between, Phillips 66 operates a refinery in Rodeo, and two other refineries (Shell and Tesoro) straddle Martinez. Residents of these towns have joined in the crude-by-rail fights as well — lending their comments to Environmental Impact Reports, attending community meetings, and joining together for “healing walks” between communities. The network of support has even extended hundreds of miles south. The Phillips 66 refinery has two parts — one in Rodeo and the other 200 miles away, just outside the town of Nipomo in San Luis Obispo County. A pipeline joins the operations. The refinery has expansion plans that are currently being reviewed. One part of those plans involves building a new rail unloading facility in Nipomo that would bring in five unit trains of crude a week, with 50,000 barrels per train. Further south in Kern County in the heart of oil country, Plains All American just opened a crude-by-rail terminal that is permitted for a 100-car unit train each day. Another nearby project, Alon USA, received permission from the county for twice as much but is being challenged by lawsuits from environmental groups. Closer to home, though, unit trains are already arriving. In March, an investigation by local TV station KPIX revealed that Kinder Morgan, a “midstream” company which is in the business of transporting crude (usually by pipeline or rail), received a change of use permit for a rail terminal in Richmond. Kinder Morgan had been transporting ethanol, but the Bay Area Air Quality Management District OK’d Kinder Morgan to offload unit trains of Bakken crude into tanker trucks. KPIX journalists followed the trucks to the Tesoro refinery in Martinez, just across the Carquinez Strait from Benicia. Aimee says her group’s biggest fear is the threat of derailment and explosion. The same is true for many Richmond residents near Kinder Morgan’s rail terminal. “The permit was given illegally by the air district, without concern for the health and safety of the community,” says Andres Soto, an organizer with Communities for a Better Environment. “Should there be a catastrophic explosion — there are residences and two elementary schools across the street from the railyard.” He also says that the blast zone in Richmond contains a total of 27 schools. The blast zone is defined as a half mile away for evacuations if there is a derailment and one mile away if there is an explosion and fire. Earthjustice has appealed Judge Bush’s decision, but residents are continuing to fight the permit in other ways. On October 28, the Richmond City Council unanimously passed a resolution calling on the Bay Area Air Quality Management District to review and “if feasible, revoke the permit and subject the project to a complete CEQA process,” which would be a full environmental review. Ed has come to a similar understanding. He is focused on the trains passing by his shop, but the process has opened his eyes to a lot more. He’d heard about the impacts of tar sands and Bakken crude but didn’t have a personal connection to it until unit trains began arriving in California. “Just focusing on what’s happening in my little neck of the woods has led me to spend more time really looking at the big picture,” he said. “The climate is rapidly changing for one reason or another and probably a good portion of it is what we’re doing with the burning of fossil fuels and so forth, especially this rapid extraction. “I can’t go to New York and demonstrate or deal with the Keystone XL pipeline, but we can look around here, keep our eyes open, and try to articulate what we’re seeing locally,” says Ed. The Planning Commission’s ongoing public hearing on the Valero Crude-By-Rail Project draft environmental impact report resumed Thursday. It lasted until 12:30 a.m. Friday and it still wasn’t long enough. After hearing hours of comments and testimony from the proposed project’s supporters and detractors, the Planning Commission decided to continue the hearing a second time, to its Sept. 11 meeting, to give more people — including commission members — a chance to weigh in on the environmental document. As they did when the hearing first was opened July 11, members of the public filled the Council Chamber at City Hall, which has a capacity of 120, including the commission, staff members and those handling the recording and broadcast of the meeting. Between 20 and 30 were seated in the Commission Room and another dozen or more were in a City Hall conference room, where they could watch the proceedings on a screen. Nearly 20 more sat in the City Hall courtyard, where they could hear an audio broadcast. 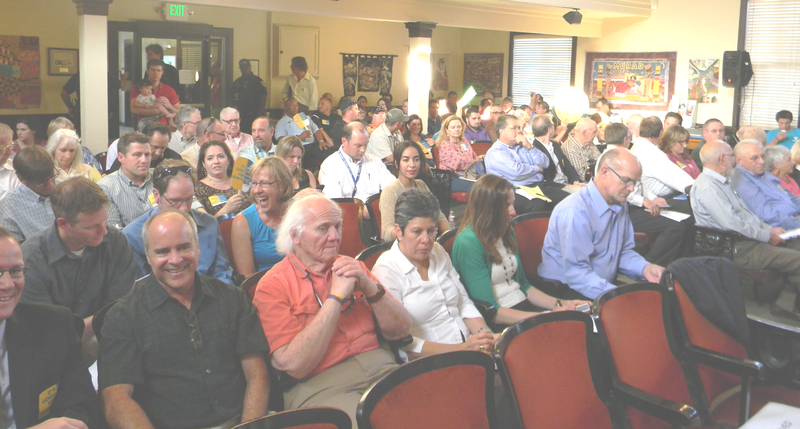 More than 70 chose to spoke Thursday. Unlike the practices at past meetings, city staff kept the Council Chamber doors locked until about 6:15 p.m. while additional sound equipment was put in place. Once the room was filled, those attending the hearing were directed to side rooms. 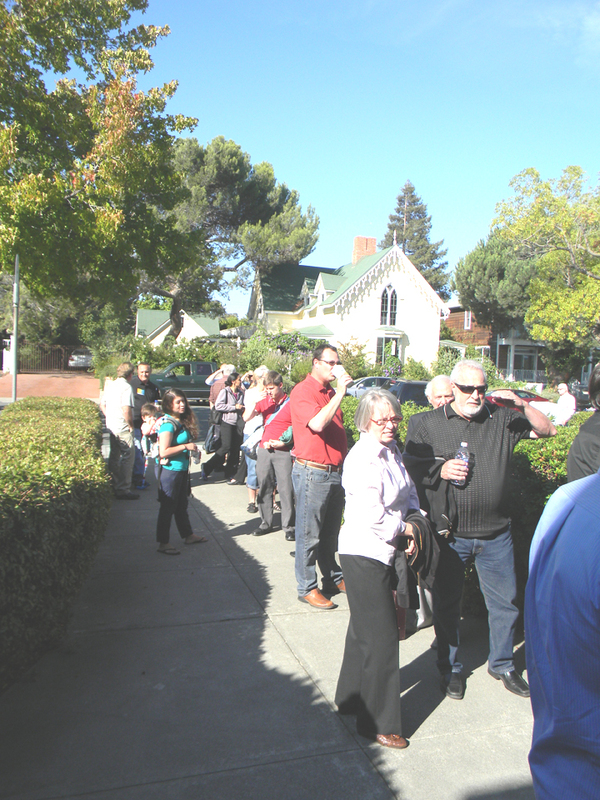 Despite the packed City Hall, several speakers said Thursday that people in Benicia remained unfamiliar with the project, and many didn’t even know it had been proposed. The project initially was proposed after Valero wrote its land use permit application December 2012. The Benicia Department of Community Development has been taking public comment since May 30, 2013. Public comment on the draft environmental impact report (DEIR) will be taken until the close of business on Sept. 15. The project would add 8,880 feet of rail and would modify or expand some of the refinery’s infrastructure. Once completed, it would enable the refinery to accept up to 100 tank cars of crude oil a day in two 50-car trains entering refinery property on an existing rail spur that crosses Park Road. The crude would be pumped to existing crude oil storage tanks by a new offloading pipeline that would be connected to existing piping within the property. Using photographs, maps and some animation, Ed Ruszel, who owns a business near the proposed construction site, showed how railroad tracks in the city’s industrial area have been reduced, changing from loops that circulated trains around the area to cul de sacs. He said the project would impact trafic more significantly than described in the DEIR, especially along commercial driveways and along Interstate 680 and major Industrial Park roads, such as Bayshore Road. He criticized the contention that the twice-a-day trains that would arrive and depart the refinery would have little or no impact on traffic, saying Union Pacific Railroad won’t agree to limits on volume of product it ships or frequency, routing or configuration of its shipments. In general, railroads are governed under federal law, not by state or local agencies or regulations. Marilyn Bardet, speaking briefly for Benicians for a Safe and Healthy Community, one of the organizations that opposes delivery of crude by rail, said some issues were “obscured” in the DEIR, especially those affecting railside cities besides Benicia. “The local and regional impacts spiral out,” she said. Because trains and railroads are regulated at the federal level as interstate commerce, she said, Valero would have little control over Union Pacific, the railroad the refinery would hire to deliver the crude. Straw also questioned the safety of the reinforced tanker cars the refinery has promised to use instead of those currently in use. He urged putting the process on hold until only new tank cars and stronger federal rail regulations are in place. Bibbi Rubenstein, also with Benicians for a Safe and Healthy Community, disagreed with project supporters that allowing Valero to bring in crude by train would provide any significant jobs, either during construction or once the operation started. More supporters of the project spoke than detractors. Among them was attorney John Flynn, who said he has been helping Valero Benicia Refinery during the environmental review process. Flynn reminded the commission that the DEIR applies to elements over which the city has control — not those it doesn’t. “Context is essential to any fair discussion,” he said. In answer to those who sought to delay the project until new federal guidelines are adopted to improve the safety of rail delivery of crude oil, he said rule changes “can’t be the reason to delay,” because Benicia can’t control the federal government. “Does that mean … that you don’t have a voice?” he said. “No.” But people need to express those concerns to the Department of Transportation’s Pipeline and Hazardous Materials Safety Administration in Washington, rather than to a city panel. “The city has drafted a DEIR it can be proud of,” he said. “It sounds ominous,” he said; however, he explained that phrase is a California Environmental Quality Act term to note that certain thresholds would be exceeded by the project. And those thresholds differ by county, he said, and numbers that might indicate no impact in Placer County could be considered “significant” in Yolo County. The air quality differences caused by the project in those areas would be the equivalent of 10 round trips from Benicia to Tahoe in a diesel recreational vehicle, Cuffel said. “That doesn’t seem quite so fearsome,” he said. Another term that bothered some residents was “unavoidable,” used in the DEIR to describe some of the impacts. Cuffel said that word meant no mitigation was available to Benicia or Valero because the situation is governed at the federal level, not the state or city level. “I hope this brings peace of mind,” he said. The volatility of crude oil brought in from the Bakken fields of North Dakota also worried some who spoke Thursday. But Cuffel said Valero Benicia Refinery has been shipping more volatile chemicals than the light, sweet Bakken crude. Some speakers were not reassured. Ramón Castellblanch joined others who were skeptical of the information provided by the refinery to ESA, the city’s consultant that composed the DEIR. While some contended the consultant had started with a desired goal and found statistics to match, or accused the refinery of manipulating numbers, Castellblanch pointed out that Valero Energy, the local refinery’s owner, had paid millions to the Environmental Protection Agency in 2005 for air pollution violations, and that in 2008 and 2009 the Benicia refinery was cited for 23 violations. Such characterizations were countered by other speakers, such as Larry Fullington, who described the Benicia refinery’s history that dates to 1969, when Humble built the plant. For the past 45 years, Fullington said, the refinery has not experienced any overturned oil tanker car. “Valero is one of the safest in the nation,” he said, joining those who pointed out the refinery is the only one of two in California — the other also belongs to Valero — to be certified by the California Occupational and Safety Act as an approved Voluntary Protection Program Star site. Valero Benicia Refinery has been earning that designation since 2006. “They truly care about safety,” Fullington said. Union Pacific Railroad, the company that would be transporting crude oil should the project be approved, “is one of the most prestigious firms,” he said. Fullington noted that some critics had expressed fears that the project could lead to an event similar to the 2013 Lac-Megantic tragedy, in which an unmanned runaway train derailed as it sped along the tracks and killed 47 people in Quebec, Canada. But circumstances in Benicia “aren’t even close,” he said. Several speakers had described the July 6, 2013, Lac-Megantic incident in which a crude-carrying, 74-car train had been left unmanned but with one locomotive running to provide power to air brakes. Emergency responders had responded to reports of smoke and fire. The locomotive was shut off, and the train again was left unattended. Without the air brakes, the train began rolling down the hill and picked up speed as it approached Lac-Megantic. The train derailed and exploded. At least five of the 47 who died were thought to be incinerated; 30 buildings were destroyed and water lines were severed and couldn’t be repaired until December of last year. On Thursday, Giovanna Sensi Isolani called crude-carrying trains “rail bombs” as she spoke against the project, and Alan C. Miller demanded the refinery build a rail bypass that would set rail traffic back from heavily populated areas. But Fullington explained how Benicia’s circumstances were different. “Valero is on level land,” he said, and trains going in and out of the refinery would travel at 10 mph or less. At that speed, he said, a car that derailed simply would sit on the road bed. Nor, he said, would a train be left alone, as it was in Lac-Megantic: At several public meetings, refinery officials have said no train would be left unattended. Fullington said the refinery also had stated it would use the reinforced tank cars that are sturdier than the current Department of Transportation-111 model. The reinforced types are numbered 1232, and he said the ones Valero would use would be manufactured by reputable companies. And by bringing North American crude to Benicia, he said, the company would help the nation reduce its dependence on oil from other countries. James Bolds, a rail car specialist who had traveled from Montgomery, Texas, to speak, said he had been hired by Valero to develop specifications, review drawings and review the cars it would use for its project. He described the 1232 car as being made from high-strength steel, with reclosing valves, head shields and other features that make it stronger than the DOT-111 car. Others remained unconvinced, saying the DEIR didn’t delve deeply enough into possible seismic disturbances; into who would be responsible for the cleanup and liability of any accident; whether train safety could be assured along the Feather River and other places California has considered high risk for derailment; or why the city was considering the project before new federal regulations for tanker cars, rail inspection and automatic systems were in place. They weren’t swayed by supporters’ reminders that Valero annually contributes about a quarter of the city’s General Fund revenues, and that it had donated more than $13 million to area charities in 10 years; that the refinery employs 450 people, contracts for another 250 and supports 3,900 others; or that the project would provide temporary jobs to 120 construction workers and create 20 permanent jobs at the refinery. Rather than wrapping up the hearing as it kept going until early Friday, the commission unanimously decided to continue the opportunity to take public comment at its Sept. 11 meeting, at which commissioners also would be given a chance to speak.